A new study reveals the possibility of reducing muscle damage from oxidative stress by consuming dark chocolate before exercise. Cocoa is known to be a key ingredient in many foods. The wonder and fame of cocoa have invaded people in every part of the globe, however a few only know of its origin. The origin of the chocolate first started when the cacao tree was discovered in the tropical rainforest of Central and South America. The pods of the cacao tree contain seeds which can then be processed into chocolate. The first group known to first discover and make chocolate were the early cultures of Central America and Mexico, and together with the Aztec and Mayan people, they were able to make a spicy drink when they mixed cacao seeds with various seasonings. The seeds were brought back to Spain by the conquistadors where they created new recipes from the seeds of the cacao plant. Through further development of technology and innovations, chocolate has continuously developed from its texture to taste as it becomes the chocolate we come to know now of, and it remains to be one of the world’s most favorite flavors. As mentioned, chocolate comes from the seeds of the cacao trees that grows on the shade of tropical rainforests near the equator. The cacao trees produce brightly colored pods and if opened, you’ll find cacao seeds, typically 30 to 50 in number, which are nestled together in one pulp. These seeds undergo certain processes to become the chocolate we now know of. Despite the pleasure and happiness that consuming chocolate gives us, it is also important that we also watch for our health too, even when taking something as irresistible as chocolate. Not all chocolates are made equally, and with this notion, dark chocolate contains more cocoa, therefore containing more flavonoids, compounds that act as antioxidants that helps ward off free radicals, than other types of chocolates. A small bar of dark chocolate everyday helps in the healthy functioning of the cardiovascular system, as it helps lower blood pressure and cholesterol level therefore reducing the risk of heart disease. It also lowers insulin resistance levels and can act as effective cough suppressant due to its theobromine content. The positive mood that is created by dark chocolate helps in improving information processing in the brain. Visual contrast sensitivity and cognitive performance was also developed due to the cocoa flavanols found in dark chocolate, where researchers have observed that blood flow to the retina and brain was improved. This is according to the researchers from the University of Reading, whose work was published in the journal Physiology and Behavior. Dark chocolates contain much more flavonoids than milk or white chocolate – not to mention that milk and white chocolates are packed with sugar. The flavonoid compounds present in dark chocolate are useful in treating patients with anemia and those with poor dietary habits. It also boosts the immune system and prevents chronic illnesses and detoxifies the body, making the body healthier and sick-free. Though dark chocolate is known to provide a lot of health benefits for the body, it is still important to take note that too much chocolate may deprive you of the benefits you expect, therefore regulating the amount is important. Reactive oxygen species (ROS) are naturally produced by oxygen-breathing organisms. These ROS play an important role in many body functions. However, when these ROS are over produced in the body due to exogenous sources like cigarette smoke exposure, environment pollution, excess alcohol consumption, asbestos, ionizing radiation exposure, bacterial, fungal or viral infection, intense exercise, and even simple aging, the body’s antioxidant defenses may be overwhelmed and this can lead to oxidative stress. Generally speaking, oxidative stress is termed as an oxidative damage in a cell, tissue or organ caused by ROS. Oxidative stress is also found to be an underlying mechanism in the development and increased risk of many diseases such as cardiovascular diseases, cancer, diabetes and Alzheimer’s disease. A new study has found that possible damage effects of oxidative stress to the muscles may be reduced by dark chocolate consumption before exercising. Findings published in the European Journal of Nutrition states that dark chocolate with 70 percent of cocoa is correlated to oxidative stress blunting after exercise because of a reduction in the levels of the compound F2-isoprostane. 14 healthy mean were recruited by Davison and his co-workers to take part in the study. Volunteers were asked to take dark chocolate of 100 grams, a control bar, or nothing at all. After two hours, they were required to perform 2.5 hours of cycling at a maximal oxygen uptake level of 60 percent. A boost in antioxidant status prior to cycling and reduced F2-isoprostane levels 1 hour after cycling were observed due to the intake of dark chocolate, compared to the control bar. A better continuance of concentration of plasma glucose was also achieved for men who took dark chocolate because of increased insulin levels before the trial and after cycling, according to the scientists. In contrast, there were no observed changes in immune response markers, known to be influenced by rigorous exercise. Glen Davison and his co-scientists from Aberystwyth University in Wales said that the minimal effects in the study is important physiologically, but occurs from metabolic changes because of cocoa, therefore directing to the modulation of the major plasma constituents. Dark chocolate as well was observed to be effective in blunting the increase in plasma total antioxidant status due to exercise, as was monitored in other trials, supporting the idea that physiological significance is shown by the improved total antioxidant status in dark chocolate. 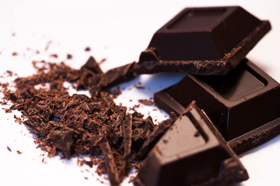 The findings of the researchers reported that effects were evident after only 100 grams serving of dark chocolate, and that it is possible that through different timing and quantity of dark chocolate ingestion would result to greater blunting on the response of oxidative stress, though further study is still needed. The researchers also wrote that acute consumption of dark chocolate results is quite similar to those who were observed to be following ingestion of dark chocolate daily for 2 weeks. The Nestle Research Center funded the study. Affiliations of the other scientists included the Loughborough University, the University of Newcastle in the UK and the Nestle Research Center in Lausanne, Switzerland. Your Heart Truly Loves Chocolate! Posted: June 8th, 2011 under chocolate, Flavonoids.